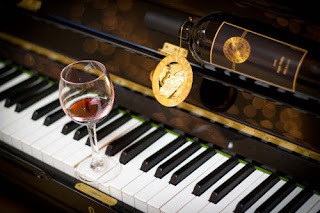 The Culinary Gadabout: As if Napa wasn't fun enough! As if Napa wasn't fun enough! I've gotten used to the way the folks over at Napa Valley Wine Train come up with surprising new ideas, but the latest one still managed to surprise me. It shouldn't have, though, because it makes perfect sense to turn the plush departure room at the Wine Train Depot into a once-monthly sing-along piano bar. Best thing? Admission is free, all ages are welcome, and there is no drink minimum (although beverages are available). The evenings run from 7-10 p.m.
April 28: Classic Hipster songs (Frank, Sammy, Dean, Ella, Billy, and all those cool cats). Music provided by pianist Dan Daniels with Nicky De Paola on vocals. May 26: Piano Bar Sing Along (more information to come). June 22: A Toast to Broadway, with pianist/singer Andrew Moore. Can the Epigenetic Diet prevent cancer? World Best’s Wine Book from…Sweden? !